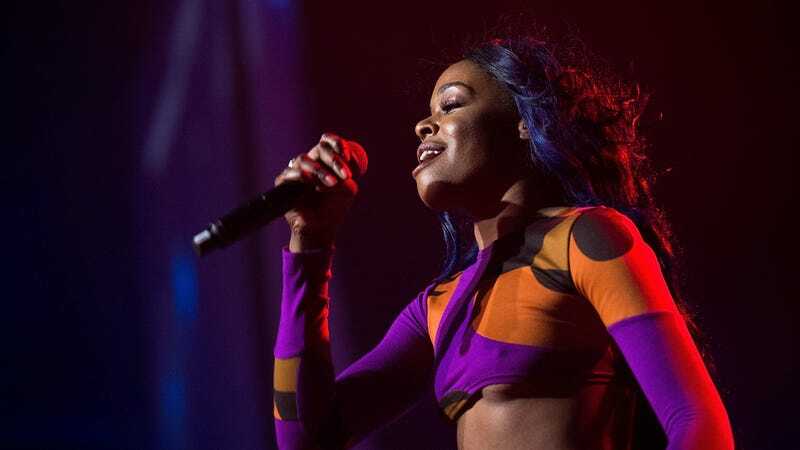 Will Someone Check on Azealia Banks, Who Has Been 'Alone' at Elon Musk's House 'for Days'? Immediately upon reading this, I envisioned Banks sitting in the dark in the luxury space pod I assume lives in Elon Musk’s living room, hands folded in her lap, waiting patiently to pounce on an unsuspecting Grimes once she and her paramour return from a busy week of turning the hose on Tesla employees whose sneezes sound something like “UNION!” Is that what’s happening? Hard to know, as I am not one of the teeny Martians that Musk either holds captive in his home for entertainment purposes or are there of their own volition to spy on Musk through the walls. But according to Stereogum, here’s what went down. Banks had announced earlier this summer that she planned to collaborate with Grimes on a track on her upcoming album, Fantasea II: The Second Wave. Whether or not Grimes approved this collab is unclear, but it appears, per an Instagram story Banks posted this weekend, that she somehow gained access to Musk’s house, then decided to stick around, even though neither Grimes nor anyone else except probably the Martians were there. Usually, when I want to hang out with a friend, I text that friend before showing up at their boyfriend’s Bel Air mansion, so it’s not all awkward when I’m there and they’re not and I have to spend a week making small talk with the robot butler. But that is why Azealia Banks is Azealia Banks and I am me. Anyway, I hope someone is feeding her.